The bubble sizes were originally based on the diameter of the circles, not the area. This is a big mistake! The author has since fixed this so the graphic above is now correct. There are too many colors. I find myself going back and forth to the legend. It shouldn't be so hard for the readers. The colors in the legend are in no particular order; not alphabetical, not by deaths, nor not by money raised. This is way too confusing. It's difficult to trace the relationship between the deaths and the money raised. Taking these difficulties into account, I have created this slope graph. We can see the ranking relationship between the cause and the disease much easier. 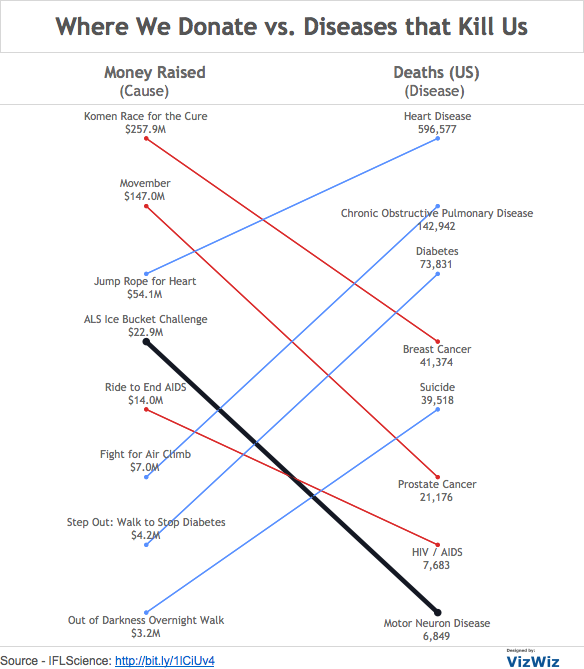 I've highlighted the Ice Bucket Challenge since it is the focus on the article. I colored the remaining line by red or blue to indicate a decline or increase in rank respectively. I labeled the ends of the lines directly to eliminate the need for a legend. One additional element that would add value to the slope graph would be to include the bubble size. If you'd like to build your own infographic, you can download the data here and/or the Tableau workbook here. So much easier to understand! Thanks for improving the graphical world, one post at a time. Thanks for the tip Karyn! Looks good Tom. Do you need the colors for the bars though? I guess I don't need to colors, but since I did I should have made breast cancer pink. Tom, one thing I teach is when you're creating a visualization, you should simplify and remove things until there's nothing more you can take away. Basically, remove anything that is not adding value. Sorry, but I'm not sure this is a great improvement. The biggest problem by far is the lack of vertical scale, which makes the slopes of the connecting lines meaningless. If that were fixed, there may be some insight to be found here. Tom's submission does a better job, I think, but all 3 visualizations are probably over-complicating things. Seems to me that the real point that's trying to be made is how much money is raised per death. A simple bar chart of that value is where I would start. (BTW, it's $14,600 for ALS vs $91 for heart disease. That's kind of a big deal, and none of the visualizations make that kind of discrepancy clear). Excellent point about over complicating the story! You're right, a simple bar chart of the amount raised per death would be great. It's amazing that the perspective of the reader influences interpretation of the graphic/numbers. My perspective is that cancer is still scary because of how indiscriminate it is for age etc. and everyone knows someone who has been touched by breast or prostate cancer. YET MORE PEOPLE DIE FROM HEART DISEASE THAN ALL THE OTHER DISEASES ON THE CHART PUT TOGETHER.